Delaware County History: Chester's 1724 Courthouse to be leased?? Please read !! Chester's 1724 Courthouse to be leased?? Please read !! The 1724 Courthouse on Edgmont Ave. about 1900. 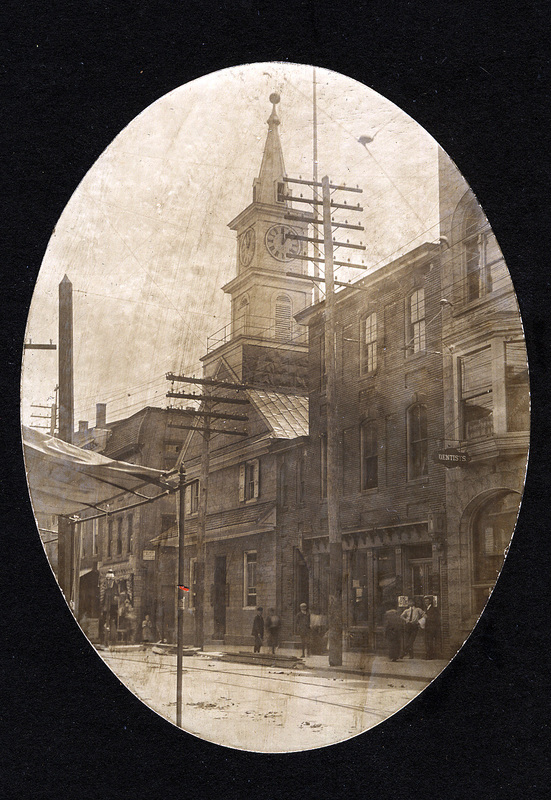 In the 1870's the tall steeple and clock were added. The courthouse was restored in the mid 1920's. NOTE. The Penna. Historic Museum Commission is looking to lease or sell the 1724 Courthouse in Chester to a group or individual. In the last 10 odd years the commission has made long term leases for various state properties including the Morton Morton Homestead in Prospect Park and the Brandywine Battlefield. These are not small unknown historic buildings, the Morton Morton Homestead is the oldest house in Penna. and the Brandywine Battlefield is the site of a major Revolutionary War Battle. Now the 1724 Chester Courthouse, the oldest courthouse in Penna. Below is a link for future meetings for concerned people. Please signup and spread the word!! As you might have suspected, I was unsuccessful at finding a time early in this month for this group to meet to discuss the next steps for the Old Chester Courthouse. I’ve included a Doodle link below and ask that you take a minute to check your calendars and respond with whatever dates and times your are available. I believe it’s important for us to begin these conversations in earnest, so I will choose a date and time that is convenient for the largest number of folks. Also – if you believe there are others who should be included in this discussion that weren’t at the first meeting and aren’t on this email, please forward this message and ask them to email me so I have their name and contact information. Pennsylvania has a new statewide historic preservation plan! Check it out and learn how we can work together to make sure #preservationhappenshere in Pennsylvania every day.